I was asked for my thoughts on how to get upgrades without paying for them and in general I said it just doesn’t really happen much anymore. That’s especially true if you have no status with an airline. But, the author still was able to cobble together some tips for those who want to chase the elusive free upgrade. How’s this for a shock? I’m quoted with consumer advocate Charlie Leocha in this story and we both agree. Mandatory fees that are broken out separately are terrible. Hotels should not be able to break out resort fees, just like airlines can’t break out mandatory fees. But it’s a double standard and airlines are always treated more harshly for some reason. When LV hotels started with the resort fees we stayed at hotels that did not pull that crap. When most of the hotels started pulling the same tricks we stopped going to Las Vegas and now we don’t miss it. Great job Caesar’s and the rest. My son and I scored a United CPU for our flights today. First time in a couple of years, with Gold status. Way down from my pre-IT integration 50% upgrade percentage. On a recent trip to GRR I booked my hotel online at marriott.com for one of the properties there. I have been doing this for years so, I thought I knew what I was doing. The rate showed up as usual under “rates starting at” and went ahead and confirmed. Just routine, right? When I checked out I discovered that my room rate had increased for nights 2 and 3 by $20 per night. Guess I didn’t look closely enough at the small print. I objected and prevailed but, I feel that this is a new Marriott policy of ‘bait and switch’ with no notice at the booking site. I am accustomed to the rate changes in LAS because of the resort nature but, Grand Rapids? Seriously? BTW when you do book in LAS and the rate changes during the stay they prominently tell you at time of booking. Beware! Is the smug woman in #5 still married since she could have cared less about her husband and child? I am a little more than a cranky flyer, I am a very reluctant flyer. I am tall and cannot sit in a cramped seat for hours on end any longer without pain, plus I have no A$$ left, so it hurts my rear end to sit for so long with my knees up to my chin and a LARGE person who is flowing into my seat so much so that I can’t move. As a frequent flyer with status on several airlines, i find it less and less likely airline will upgrade. it is no longer about loyalty or customer satisfaction. I find that in todays world, especially on the new American Airlines it is pure GREED. I have status on American and i find that they no longer care if customers are happy or not as long as they pay. They charge for pillows, blankets, and even leave seats empty in first class rather than bump frequent flyers. As part of the merger between US AIR and American, it is really difficult to understand who bought who. I was a loyal US Air Ways member, but after the merger, i lost most of the perks i use to get with US AirWays, for instance when booking a flight, as an elite member, i could choose an exit row AND get on the standby list for First class when I booked my flight. This encouraged me to book early and it benefited the airline by flights booked earlier. But the NEW American Airlines, that optionis now DEAD. The earliest you can try to get an exit row without paying for it is 24-48 hours before the flight. Recently i took a trip between Dallas and Phoenix and as a frequent flyer I got an exit row confirmed two days before the flight. I double checked a day prior, and at the gate, i again confirmed i had an exit row seat, and when I boarded and scanned my ticket at the gate, the alarm went off to validate that I am willing and able to assist in an emergency. BUT, the aircraft seat assigned WAS NOT an exit row seat and was one behind. If I had been told, i could have changed my seat or used pints to upgrade, but the airlines failed and it felt like they deceived on purpose. I wrote the airline and they sent a canned response about not being able to control acts of god and other non relevant items. The response was more insultign than the failure/lie on thier part. At this rate, it no longer benefits to be a frequent flyer or on a loyalty program. I would go out of my way to find the US Airways flight even when t was more expensive. Now it is not worth it, i gain nothing. I might as well choose the cheapest, Delta and United are by far the cheaper than the New America. 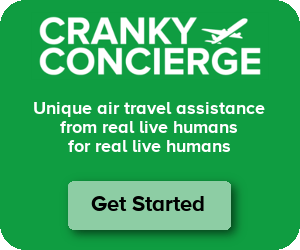 For all the advice here, non of it requires a frequents flier program to be successful, actually, if you read carefully inot this article and many others, the more people on these programs the less special they are and they least likely they will benefit you on any flights in the future. I for one, think that if we can get Congress to pass a very strict Passenger Bill of Rights so we no longer are at the mercy of the airlines to interpret or imply that FAA rules dictate how customers should be treated. I mean really, why do we have to agree to work for the airlines to get a seat in an aisle that has more legroom and leads to an exit. If is TRULY a safety issue, then remove the seats and have it fully open and eliminate the airlines ability to make money off an item that they are expecting you to work for. I think if the airline was faced with the choice, they would rather let you sit there for free than give up that revenue, which if true, means it is not about safety but rather about the revenue (GREED)! If we had some passenger rights, some hard rules in place that truly protected passengers you would see the airlines change a few of the things that treat us like dirt when we fly. Included in this Bill of Rights congress needs to hold employers accountable for forcing employees to fly under these conditions. It is one thing for a company to force you to travel for business, but then state how you will fly, what kind of seats you can purchase and how you cannot buy upgrades, different class of seating for lag room, etc. If this Bill of Rights protected the flyer both from the airline and the employer, then you would see changes by the airlines, if not just because it is a law, but corporations that deal with airlines and need to send their people on business trips would get pressure form them as well if the Bill of Rights meant they had to allow their employee to fly in comfort. You want to talk about “GREED”, let’s talk about it. All public companies have to answer to their investors and create positive dividends for their shareholders. That is the main reason we have seen corporations going after every single penny where they can. If they can’t produce these profits for dividend payments, then the stocks lose their price per share which is money lost. The only way you will see this stop is when shareholders stop the demand for higher dividends which will be NEVER. I am 1k with United and have noticed in the last year or so that things are getting better; i get upgraded about 75% of the time and I’ve never had my seat switched. I wonder if the AA./US Airways merger will turn out to be as horrible as Continental/united.